The Archivist from the Westtown School, is going to speak to our ANG Main Line Chapter about the Westtown samplers on April 11. She’ll bring her own computer and projector for the presentation & use the wall to project as we did at our other presentations this year. Westtown (just outside of West Chester, PA) opened in 1799. Plain sewing, samplers, pin cushions and other handiwork were done by girls until sewing class was eliminated from the curriculum in 1843. Contact us at: MainLineStitchersChapter@needlepoint.org for more information. I made a Google Map for Philadelphia Area Local Needlepoint Shops. The stores are located within an hours drive (or so) of Philadelphia (this does include New Jersey stores). I can add more anytime. If you know of more in the area, leave me a comment & I’ll add them. I feel so techy right now!! So, how’s it all done? Well, go to Google Maps (http://maps.google.com/maps?hl=en&tab=wl) and click on My Maps for a 3&1/2 minute tutorial. It’s really that easy. You do have to have a Google account but that’s free & easy too. Create a new map, give it a title & description. Search the needlepoint store in the google maps search field. Click on the correct store & in the balloon that pops up, click on “Save to . . . ” & place it in your map. I have no financial interest in any of the stores on My Map, Google Maps, or TinyUrl.com. I must say, this was all quite user-friendly!! Give it a try for your own LNSs!! Not that I need any more threads but . . . I saw Cottage Garden Threads mentioned in Mary Corbet’s newsletter & had to go look on their website. There are some beautiful overdyed threads. Makes me want to start a new project just to have an excuse to try them! Mary’s newsletters are so informative across a variety of topics. And, free. She has a very informative website as well. I have no financial interest in either of these – I just wanted to share the info. Santa is looking good – go ahead & pull on the beard or mustache! Just the hat band left to go (excluding the four rows needed all around the piece for finishers to work with). Santa gets his full face & a red-hot hat this weekend! Even though I had spring fever from going to the Philadelphia Flower Show, I got a lot done – mostly Sunday because my feet needed the rest after walking the convention center. It sure felt like spring even with the chill in the air on Saturday. Wonderful weekend! 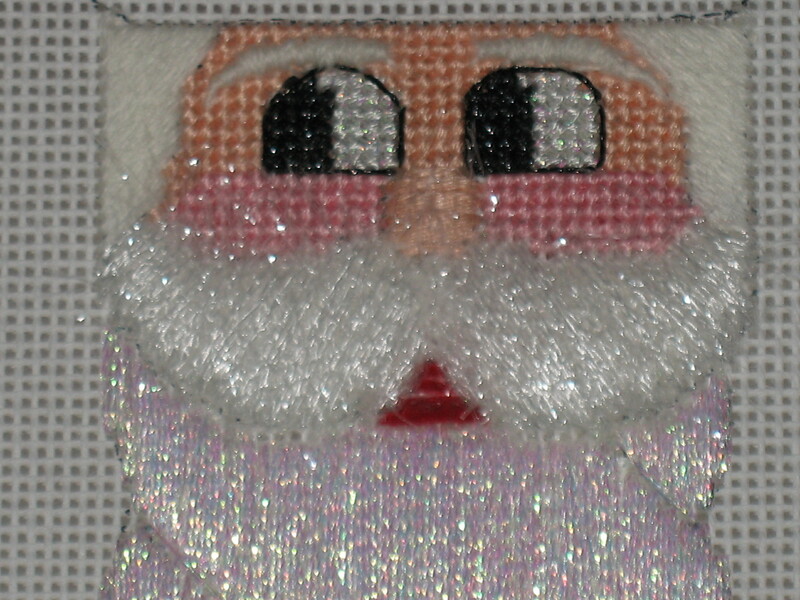 The Tied Oblong Cross Stitch on the Diagonal for his hat was tough to get the hang of & compensate. So, I did have to concentrate but it looks great. The hat has a very rich & full look with the Petite Very Velvet for the crosses, Kreinik Ribbon for the ties, & Sundance Beads. I’m really happy with my sky even though Monet’s palette had more yellow in the clouds than these. When I selected the overdyed thread, Crescent Colours Frosty (120485), it really looked blue & yellow. But, when it separated to fewer threads, the colors diffused. I had used thread blending and thread shading techniques before but after seeing how Lois Kershner combined thread blending with thread shading (as described in ‘Landscapes: Design & Stitching Techniques’) for her ‘Pajaro Dunes’, I knew I’d found my sky. I removed the few rows of Irregular Running as Giant Parisian variation in favor of the Horizontal Brick Stitch. The technique for thread shading works with most stitches but not with the running type of stitch. I subdivided the portions of the sky into 6 levels of color in the sky. One skein had slightly darker blue portions (skein #1) than the other (skein #2). So, I cut out the portions that were dark blue from skein #1, light blue from skein #2, and light yellow from either skein. I had bought 2 skeins of the floss (each 5 yards) – plenty – so I thought! Well, I ended up with just five 6-inch yellow pieces and one 6-inch light blue piece. That was close! !